Recent study done by Penn State researchers found that Walnuts Heal the Human Body and aid it’s ability to deal with stress. 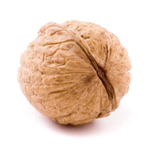 If you add this the the study in 2006 done by the University of Barcelona’s Hospital, in Spain which found that adding a handful of raw walnuts to meals high in saturated fat effectively limited the ability of the human body to absorb the harmful fat, you start to see some of the reasons walnuts are making a splash in the health scene. The walnut itself is full of anti-inflammatory nutrients, and antioxidants which are known to lower chronic stress and inflammation. They are also an excellent source of protein, omega 3, fatty acids, vitamin B’s and other minerals. According to Natural Health experts walnuts may also be a big player in healing from or preventing cancer. Prostate cancer affects one in six American men. Diet plays an important role. UC Davis and U.S. Department of Agriculture Western Regional Research Center in Albany, California have found that walnut consumption slows the growth of prostate cancer in mice. It also had beneficial effects on multiple genes that control tumor growth and metabolism. The study was done by Paul Davis, nutritionist in the Department of Nutrition and a researcher with the UC Davis Cancer Center. These findings were announced at the annual national meeting of the American Chemical Society in San Francisco. The study showed that when mice with prostate tumors consume an amount of walnuts that a man can easily eat, the tumor growth is controlled. Davis fed a diet with whole walnuts to mice that had been genetically programmed to get prostate cancer. After 18 weeks, they found that consuming the human equivalent of 2.4 ounces of walnuts per day resulted in significantly smaller, slower-growing prostate tumors compared to mice consuming the same diet with an equal amount of fat, but not from walnuts. In animal studies walnuts reduce breast cancer risk by half. Mice fed a diet which included walnuts every day had half the risk of developing breast cancer compared to those on a typical diet. Researchers from Marshal University School of Medicine reported this in the journal Nutrition and Cancer. The mice were given the human equivalent of 2 ounces a day. They followed the mice through their lifespan from conception, weaning and eating the walnuts themselves. They found that the mice that were fed the walnuts developed breast cancer at half the rate, and their tumors were much smaller and they had less of them. So what are some great ways to eat walnuts? I found this video which shows how to make your own walnut milk as well as a delicious walnut smoothie! Wow! Tastes delicious, don’t you just love the way that walnuts heal the body at the same time as giving you nutrition, energy and yumminess? What is your favorite healing smoothie recipe? I’d love to hear about it!